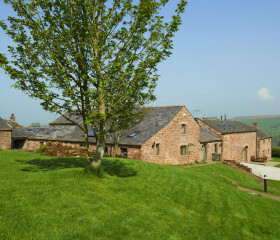 Wander the walled orchards and the majestic Lakeland fells, lonely as a cloud yet happy in your family crowd. 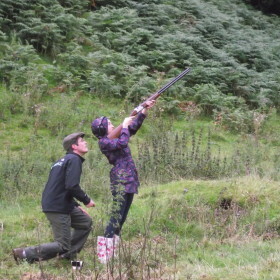 Get together in a rural idyll, light the logs and spark up the chatter, gather for drinks and dinner. Potter to the pub, savour the silence, doze off to the distant bleat of sheep. The Lakeland fells rise majestically to the rear. Through a wrought-iron gate sit woodland paths and water meadows. The church bells hang in the air across the rural bliss. You’re welcome to wander the walled orchards like Wordsworth, lonely as a cloud, yet in great company. Welcome to Kirkbride Hall, newly minted, yet as traditional as a Sunday roast in a Lakeland inn. Life here is as quiet as the church mouse from Melmerby’s St John’s across the way. 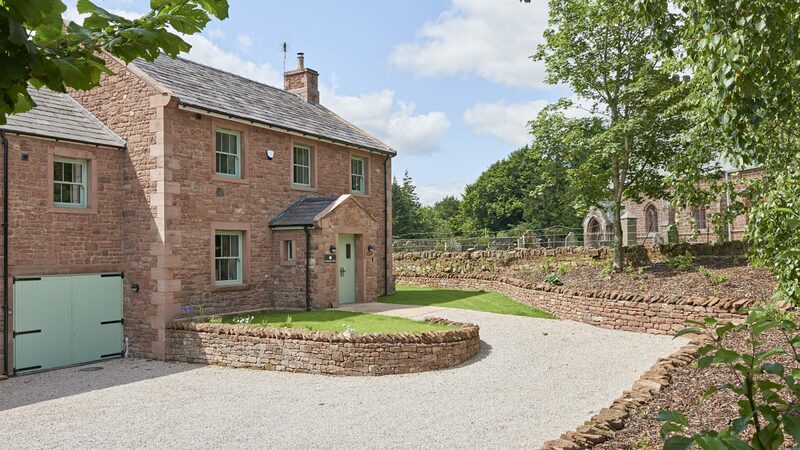 A rural idyll sleeping eight in the Eden Valley, Kirkbride Hall is the perfect place to get the family together and get to know each other again. 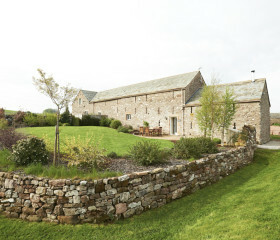 Behind the sandstone walls sourced from the estate, all is plush and clean. 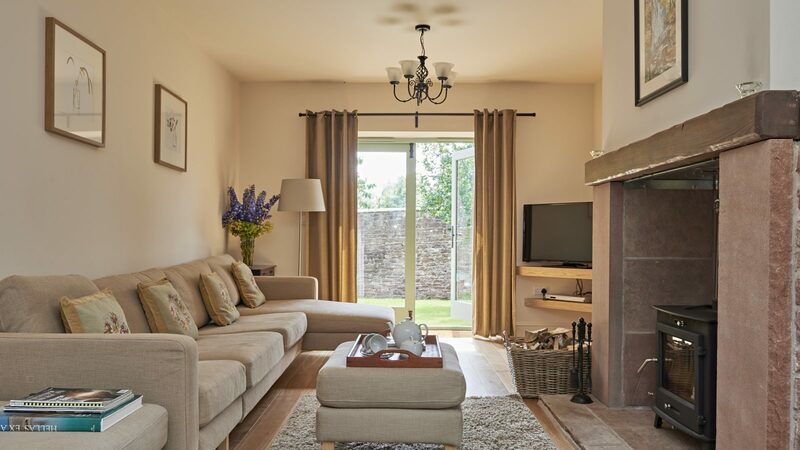 Pad across solid-oak floors, embrace the antique furniture and light the logs in the lounge; the venue for games and get-togethers. 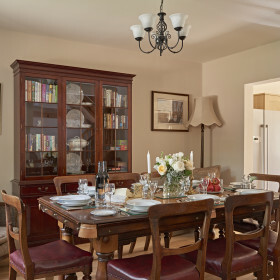 Gather in the dining room for home-cooked meals in good company. 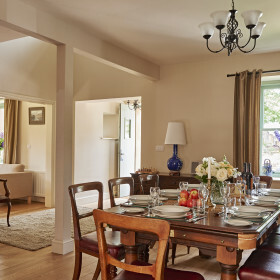 French doors open out onto a hushed world of outdoor dining among the apple and cherry orchards. Beyond, acres of grandeur stretch away. 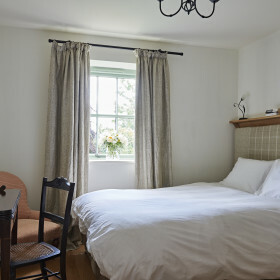 Walk the Hartside Pass, potter down to the pub, savour the silence, come back to a hot bath and soft Egyptian cotton. Doze off to the sound of the sheep and the shush of the breeze. There’s a warm welcome at Kirkbride Hall, as you step onto the solid-oak hall floor. That’ll be down to the underfloor heating provided by the wood-chip boiler system using logs from the estate. On cooler days, things are just as toasty in the spacious reception room. We’ll supply the logs – you light them. 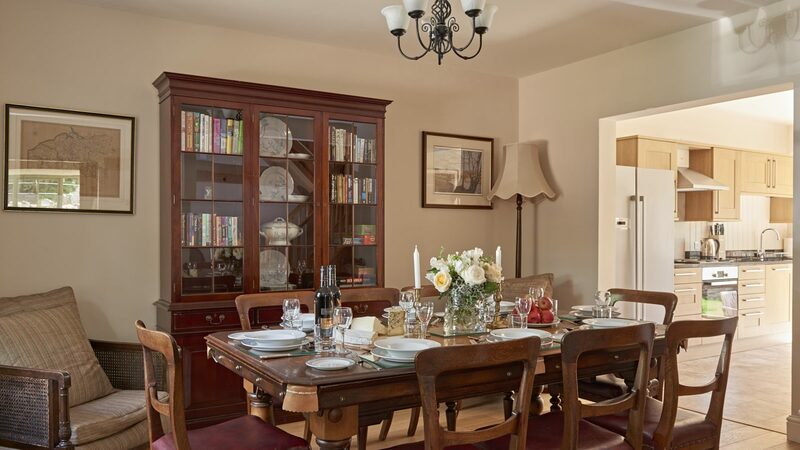 Gather round the stove, swap stories, play games, tuck in to the welcome hamper. 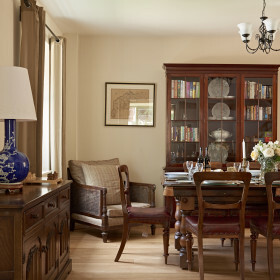 Feel the cosy homeliness in every grain of the oak floors and the antique furniture. Be a family again. 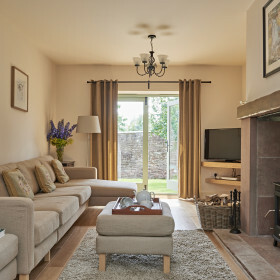 With the flames crackling, take to the bay-window nook with a book, fire up the iPod dock with your holiday soundtrack or put on a family film night. Keep in touch with the wifi. 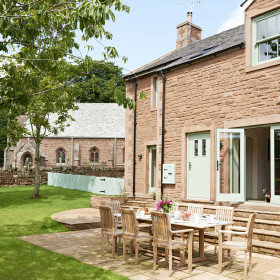 Open up the doors onto the sandstone terraces and spill out into the suntrap gated garden and the walled orchards. Done with the dining table? Convert it into a billiards table and cue up some healthy competition. In these days of rushed ready meals at staggered times, turn back the clock to hearty feasts taken as a family around the chunky dining table. 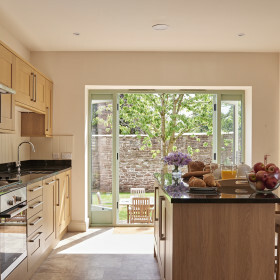 Prepare them yourself in the island kitchen with granite counters, solid oak cupboards and Bosch appliances. Or, one of our catering companies can run up anything from hearty Cumbrian Fare to a special party spread, as well as serving it to you. From a one-off celebration to a fully catered holiday, you can have meals to remember and they will whittle down the washing-up in no time. When the sun shines down the Eden Valley, get out in the garden with the Weber barbecue, and set the steaks a-sizzling and the Chardonnay a-chilling. Eating out? 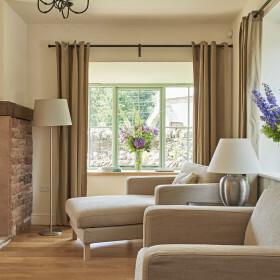 There’s a warm welcome around the log fires in the village’s Shepherd’s Inn, as well as a raft of real ales, Cumberland sausage and sticky toffee ginger pudding. Penrith’s the place for tea rooms plus cosmopolitan cuisine from Spain, China, Mexico, Thailand, India and Italy. 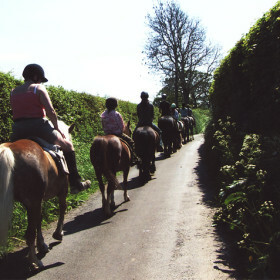 Or go gastro at the excellent George and Dragon, the Inn of a nearby village. 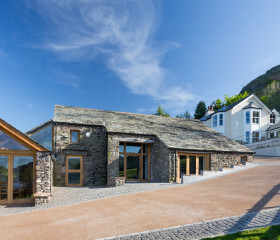 For fine and fancy dining, try Sharrow Bay, a Michelin-starred restaurant on the banks of Ullswater. Tuck in to the original and best sticky-toffee pudding recipe and wash it down with wine from the 700- strong list. At Kirkbride Hall, bedrooms are a sanctuary, exquisitely quiet and comfortable rooms in which to lounge around, luxuriate and sleep like a log. 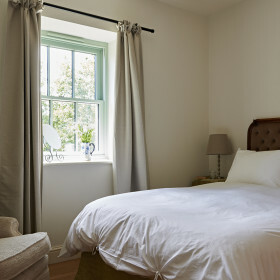 Sleeping eight in four bedrooms, with three bathrooms, Kirkbride extends an open invitation to sleep deep and take a lengthy lie-in. 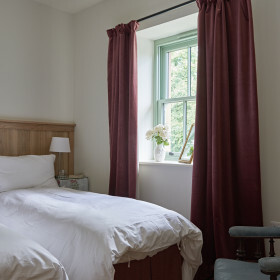 At the end of a long day exploring the Eden Valley, take a long soak, wrap yourself in fluffy towels, then collapse onto crisp Egyptian cotton sheets and dream for England. Open the window a touch and drift off to the cool night air and the bleat of the sheep on the high fells. Follow the handbuilt staircase to the master bedroom with its five-foot antique four-poster, solid-oak heated floor, chunky furniture and cool, contemporary ambience. The en-suite comes with a natural-limestone walk-in shower. 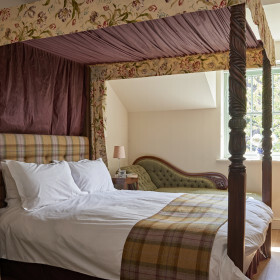 The Manor Room offers a king size bed that can be arranged as two singles on request. 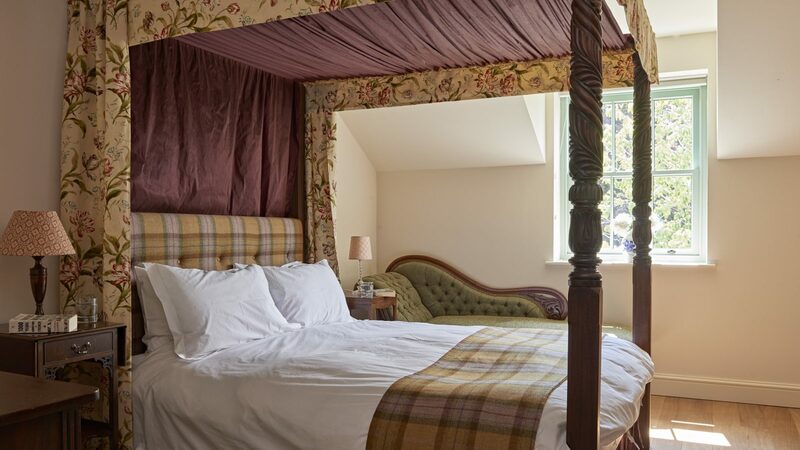 The Threlkeld Room comes with king-size bed, while the Pattenson Room is another king-size that can also double as two singles if required. These two bedrooms share the family bathroom, complete with cast-iron bath and separate freestanding shower. Fluffy towels are forever warm, thanks to heated chrome towel rails. 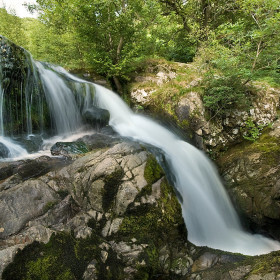 Trek the fells to Lacy’s caves or Aira Force. Be Lord or Lady of the lake on the Ullswater steamers. Tuck into Grasmere gingerbread. 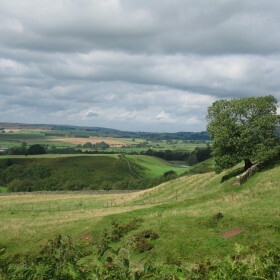 Walk the Hartside Pass, or trot back in time to country houses, gardens, castles and abbeys. Bet on a ferret at the Lowther Show. Fish, shoot, bike. The hills are alive.